New York Rangers President and General Manager Glen Sather announced today that the club has agreed to terms with unrestricted free agent forward Donald Brashear. Brashear appeared in 63 games with the Washington Capitals last season, registering one goal and three assists, along with a team leading 121 penalty minutes. He placed fourth on the club, and second among team forwards, with 119 hits. Washington posted a 4-0-0 mark in games that Brashear posted a point. He tallied the game-winning goal on December 4 vs. the New York Islanders, his first game-winner since December 14, 2002 vs. Buffalo (as a member of the Philadelphia Flyers). Brashear, 37, has scored 85 goals in his NHL career. He will be playing for his fifth team with the Rangers next season. 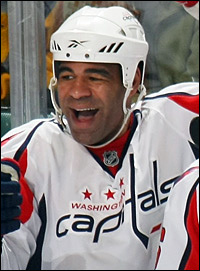 In 2007-08, Brashear led the Capitals with 119 penalty minutes and ranked fourth on the team with 133 hits. Brashear recorded five goals and three assists while skating in 80 games. The Capitals were 4-0-1 when he tallied a goal, and 6-0-1 when he registered a point. Brashear notched his 200th NHL point on March 3 vs. Boston, and skated in his 900th career game on February 5 at Columbus. On December 12, he posted his first multi-point effort since October 22, 2005, collecting two assists vs. the Rangers. In addition, Brashear tallied two points (one goal and one assist) in seven postseason contests with Washington. The 6-3, 237-pounder has skated in 989 career regular season contests with the Montreal Canadiens, Vancouver Canucks, Philadelphia Flyers, and Washington Capitals, registering 85 goals and 119 assists for 204 points, along with 2,561 penalty minutes. He established career-highs in assists (19), points (28) and shots on goal (127) as a member of the Canucks during the 2000-01 season. Brashear tallied a career-high, three assists/points on December 8, 2000 at San Jose. In 1999-00, Brashear notched a career-best 11 goals in just 60 games. As a rookie in 1993-94, he recorded four points (two goals and two assists) in 14 games with Montreal. He registered an assist in his NHL debut on November 15, 1993 at Ottawa, and tallied his first career goal two days later against Edmonton. In post-season play, Brashear has appeared in 60 career contests with Montreal, Vancouver, Philadelphia, and Washington, registering three goals and six assists for nine points, along with 121 penalty minutes. He skated in the 2004 Eastern Conference Finals as a member of the Flyers, recording four points (one goal and three assists) and 61 penalty minutes in 18 games. His three assists, four points and 61 penalty minutes were all career-highs. The Bedford, Indiana native was originally signed as a free agent by Montreal on July 28, 1992.